mmmm. I will get you all one day!!! There will be a day when you know notihng about the weapon I put up, HAHHAHAHA! 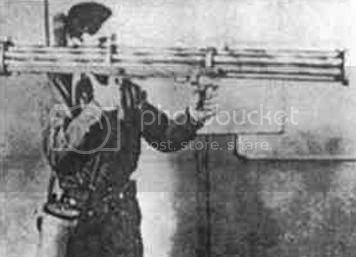 Well that is a "Fliegerfaust" developed by the Germans towards the end of WWII, probably this system produced in mass would have brought a serious threat to allied ground straffing a/c. Or just another pointless drain on scarce resources. Well done mate, Luftfaust/Fliegerfaust (technically a Luftfaust b?, Fliegerfaust having less tubes and larger projectiles). Last edited by Kruska; 20 Jun 10, 18:16. That would be a Carrier captured probably before Dunkirk and designated Panzerjager Bren (e) with 3xRaketenpanzerbuchse and a mound of panzerfausts. What's the thing goin' on near the muzzle? Surpringly no one has got it yet. Keep guessing. Hey thats the same site I got my pic off of!!! Thats cheating!! good job. Well one thing you should do is not direct link to them. Save the image and upload it somewhere else.